If you like the atmosphere of a British pub, you’ll like the look of Palmer’s tasting room. We went there on an early spring afternoon, after stopping at Bayview for fresh local spinach and horseradish root, before I started this blog, so this is a catch-up entry. The cozy room has comfortable booths and signs on the walls advertising British products, stand-up tables, and more outside room for the summer. The tasting room is towards the back of the property, as the front building houses their cellar and production facility, of which you can take a self-guided tour. The tasting menu offers six different flights of three wines each, for $8-$10. They also sell a cheese and cracker tray and bags of North Fork potato chips for $3. We opt for the Winemaker’s Reserve white and red tastings, planning as usual to share, and the server brings our glasses to a booth. Generous pour! This is a very nice white, aged on the lees. It has a spicy aroma, with some hints of cinnamon or allspice. We sense some peach taste, some minerality, and some acidity, with a back of the mouth sweetness. Overall, this is a dry crisp wine and would pair well with oysters. Calling Dr. Brown! The aroma reminds us of celery soda or seeds. Less acid than the Pinot, we taste a fruit salad of apple and grapefruit. This somewhat interesting wine has a front taste that is a bit acid, and end that is flat and apple-y, and is, we decide, a food wine, not a sipping wine. Aged in French oak, this is a fairly typical Long Island Chard, with aromas of vanilla and toast. We taste ripe peach as it opens up, with a citrus after taste. I’d like this with lobster or a chicken dish. This simple red has a blackberry bramble aroma and berry taste, a bit on the sweet side, though the aftertaste is dry. Nice. Nice sipping wine, we judge, with aromas of blueberry and other berries and a pleasant but unassertive taste. A bit sweet for us, with not much in the way of finish. Bordeaux, here we come. This is a classic Bordeaux blend of Cab Franc, Cab Sauv, and Merlot, though the taste is not quite as good as a “real” Bordeaux. The aroma is of berries, with some minerality, and the flavor reminds us of stewed prunes (which I happen to like). Maybe given time? None of the wines are bad, though we don’t choose to buy any. If I did, I’d probably get the Pinot Blanc. Reasons to visit: Comfortable tasting room, if you get a booth. Pleasant pub-like decor. Generous pour, and we liked all the wines, though we loved none of them. If you are going East with a group, and you are interested in a party atmosphere, with a likelihood of live music (though many places now feature live performers, some are more likely to than others—check their web sites), two good choices would be Peconic and Vineyard 48. Both have some good wines and both are often quite crowded on the weekends, with a number of vans and buses in the parking lot. The last time we were at Peconic (in February of 2011) we liked the La Barrique Chardonnay 07 and the 08 Merlot. We also visited Vineyard 48 that February, and liked the Sauvignon Blanc and the 05 Merlot Reserve. We tend to visit these crowded places in the winter, as you may deduce. If you will have children with you, Martha Clara is probably your best bet, as they do quite a bit of agritainment and they have a farm with interesting animals—llamas!—you may visit. We haven’t been there in a few years, so I can’t really recommend any wine in particular, though I do remember being favorably impressed with their sparkling wines. Pellegrini would also be okay, if it is nice weather, as you may take your tray of tastes outside and the children can play on the lawn. A few wineries, such as Diliberto’s, specifically say no children. If it is a beautiful day and you would like to relax in a pretty courtyard setting—and you like rosés (though if you’re not, Croteaux may make a rosé convert of you)—Croteaux is a lovely place to spend some time. French music plays in the background, and it has comfortable Adirondack chairs and a laid-back atmosphere. Another good outdoors spot is Old Field, with its mis-matched calico tablecloths and country farm background, though seating is not as comfy. On the other hand, if what you are interested in is possibly chatting with the winery owner or a server who is very knowledgeable about the wines, and you like a small intimate setting, there are several wineries we like very much. One is Diliberto’s, which we have been to frequently, though not recently. It is just down Manor Lane from an apple orchard, so you can combine apple-picking (or just buying a bag of apples and a pie) with your winery visit. On occasional Sundays, “Grandma” (a.k.a. Sal Diliberto himself) does cooking demos, making pizza or pasta, tastes of which he then distributes. He also sometimes has a singer and/or musician in. The room is small, painted in trompe l’oeil fashion to resemble the town square of a little Italian town, and we tend to like his reds. Water’s Crest, which I have reviewed in the blog, is also a small intimate space, as are One Woman, McCall’s, Sannino Bella Vita, and Mattebella. Though we’ve never encountered an owner at Shinn’s, it also has a cozy tasting room a bit off the main roads, though we only liked a couple of their wines. Jamesport has some nice whites, particularly the Sauvignon Blanc, and often sells local oysters to consume with them. We have been there on nice days when it feels like a big family party, with children playing on the lawn and musicians performing under a tent. One time we were there and the guitarist played Blues Sonata, one of my favorite jazz pieces. 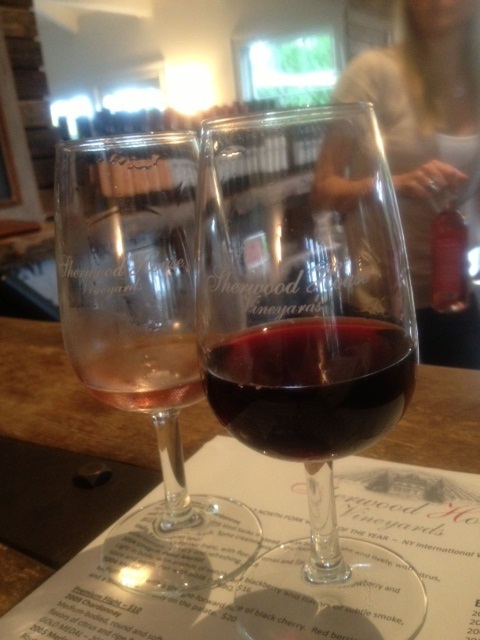 There are a couple of wineries I do NOT recommend (lest you think I like everything). One is Duck Walk, which despite multiple tasting rooms on both the North and South Forks and the presence of crowds every weekend, had several wines we actively disliked, and a rather coldly commercial atmosphere. The other is Raphael, which has a beautiful tasting room they often rent out for weddings and other parties, but which again had wines we did not particularly care for. However, they do have a nice selection of wine-related gifts. Baiting Hollow, also not one of our favorites, sells real food and lots of gift items, if that is what you are looking for. Finally, there is one rather all-purpose winery which is probably our favorite: Pellegrini. We like most of their wines, and they tend to do a rather better job with reds than many North Fork wineries. In addition, you can either stand at the bar and talk with the servers (especially Judy, who is quite passionate about the wines and knows everything about them) or take your carefully arranged tray of tastes to an inside or outside table. To me, an ideal fall day on the North Fork would start with breakfast at Erik’s, go on to pumpkin or apple picking at Harbes or another farm and/or a stroll on a beach (Even if you’re not a resident, you can now park since it is after Labor Day. Head south on Cox Neck Road, go towards Cooper’s Farm stand—best eggs ever—and on to Breakfront Beach for a good walking beach. ), then lunch at Love Lane Kitchen, a visit to a winery such as Diliberto’s, a walk around Greenport to check out the galleries and antique stores, and then another winery stop at Pellegrini’s or Old Field before stopping at Briermere to buy a pie and then heading home—or to Riverhead for dinner at Tweed’s. Well, there’s much this leaves out, but you get the idea! Enjoy. Sherwood House September 29, 2012. It was a chilly rainy September Saturday, but the agritainment business was in full swing. We passed up the Harbes Pumpkin Fest and stopped in at the Garden of Eve Garlic Fest (disappointing–no pickled garlic, only one booth making garlic braids, and lots of booths selling the same jewelry we saw at the Maritime Festival) before ending our outing at Sherwood House Winery, on the main road. They have a little tasting shack in Mattituck, on Oregon Road, in the midst of their vineyard, but now they also have a very nice though small tasting room on Main Road in Jamesport. They share their space with a shop called Material Objects, which sells various interestingly quirky household items. Inside the room, there was a lovely fire in the fireplace, very welcome on this damp afternoon, and a group of people sitting around it in comfortable chairs, enjoying a tasting. We stood at the bar, where we chatted a bit with wine club members doing a tasting and pick-up and other people. A musician in the corner played quietly. In the notes that follow, the even-numbered notes are from the Premium tasting, and the odd-numbered ones from the Estate one. Their only all-steel fermented chard, this pleasant wine has a lemony aroma and a nice, light, clean taste with a creamy finish. It would make a lovely summer sipper, out on the deck, perhaps. Good, and buyable. In contrast, this chard spent several months in oak, and has the usual, though faint, aroma of vanilla and wood. We taste unripe pear, with some grapefruit, but an unpleasantly sweet finish that we don’t care for. Screwtop! The server informs us that this is not their own wine, but is made from their grapes by another wine maker, and is in the tasting because they have sold out of their own rose. Made from cabernet franc grapes, this reminds us of cherry Kool-Aid! Dumpable. Light and sweet, if that’s what you like. This one is good with chocolate, says the server, and we agree (Though we would like to have the chance to try it WITH chocolate, none is on offer…). The aroma is dark cherry, with some oak, and the taste is moderately dry, with a faint hint of the earthy terroir, but otherwise nicely fruity. This merlot spends 18 months in oak, and is a lovely wine, and would be good with pork chops or turkey (starting to think about Thanksgiving). This is our favorite of the day, and we buy two bottles to have with barbequed ribs tonight. Not a lot of aroma, but lovely fruit tastes with a slight hint of smoke. 13 months in oak, we are told. This one spends 18 months in oak, and is also very good. The aroma is of black raspberry, and though it is dry there is plenty of plum and raspberry flavor, with a bit of oak and a slight touch of smoke. The 04 also spent 18 months in oak, and it is interesting that Sherwood House tends to hold onto their reds for several years before release. Again, aromas of berry and oak, with some sweetness and a light taste. Pleasant, but not exciting, and while we would not refuse to drink it we have no inclination to buy it. Merliance is a blend–what Lewis Carroll would call a “portmanteau word”–of Merlot and alliance, and is made from grapes grown by Castello Borghese, Clovis Point, McCall’s, Pellegrini, Sherwood House and Wolffer Estates, each of which contributes two barrels of wine to the mixture. Though not worth the price, it is a nice wine, with a flowery aroma and nice legs. The proceeds from the sale of this wine benefit various events and research sponsored by the alliance. Reasons to visit: Really nice reds, a cozy tasting room with a fireplace for cold days, the chance to browse an interesting household goods store. Buyable: Unoaked Chardonnay and Oregon Road Merlot and 05 Merlot.